What’s the perfect gift for that hard to buy for individual? A gift card! 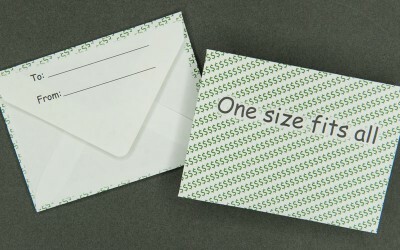 Wrap a gift card you know they will appreciate in our One Size Fits All paper gift card Envelope with “V” flap. Manufactured with 60# offset paper and printed with black and green ink. Measures 2 5/8″ x 3 5/8″.